Rope operated ladders help you avoid over stretching, unlike conventional slide up ladders; the functionality allows you to adjust your heights accordingly. The extension feature can be used in many different environments, such as on construction sites and it avoids the need to lay the ladder down to erect it. Heavy duty box section stiles give strength to the ladders and the serrated rungs are fitted through the stiles at a standard rise of 250mm, providing comfort and safety to the user when ascending or descending them. Serrated rubber feet and being constructed from aluminium add firmness, rigidity and security when placed against a wall or on other surfaces, giving the operators peace of mind when using them. 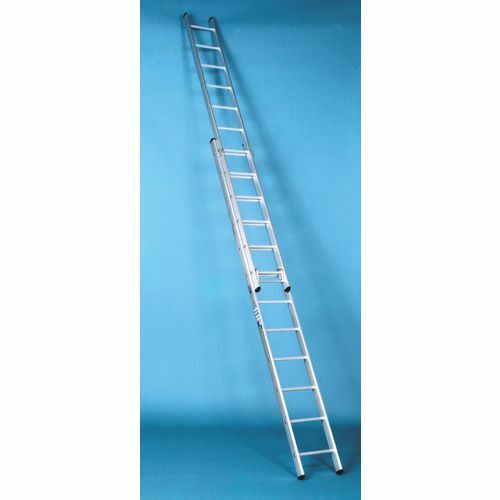 Our ladders are manufactured to British Standard 2037-1994 Class 1 for heavy duty industrial use. These two section ladders are available in four extended heights; 5.55m, 6.3m, 7.55m & 8.55m - we think they are great products for those who work at above ground levels. They come with FREE Delivery and 12 months guarantee.